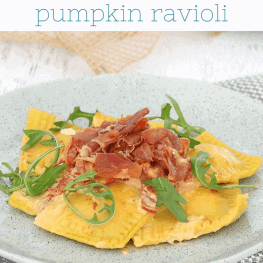 This Homemade Roasted Pumpkin Ravioli with Creamy Sun-Dried Tomato Sauce & Crispy Prosciutto is the perfect family dinner! Make your own pasta dough from scratch or use store-bought fresh pasta sheets. It’s so delicious! Umm how good is pasta!!!?? It’s pretty much the most carbalicious, insanely delicious thing EVERRRR!!! And I’m not even a savoury girl. I’m a sweets fan all the way. But pasta…. pasta is my weakness!! 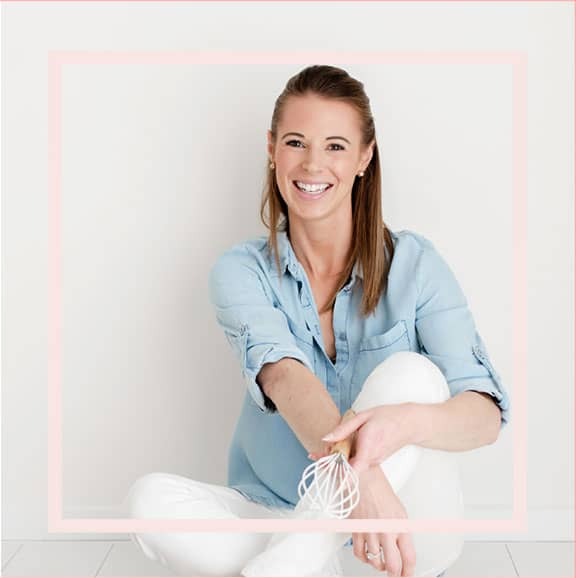 If it’s a busy weeknight, I always, always go back to my fave carbonara recipe (it only has 4 ingredients – so you know it’s going to be easy!) or this 20 minute one pot pasta with chorizo. But this recipe is totally different. It’s a fancy-pants, special weekend dinner recipe! Yep, it’s a lot more time consuming than my usual pastas, but HOLY MOLY!!! You can’t beat it in terms of flavour. I made the pasta dough, but you can totally buy fresh pasta sheets and use them if you want to save yourself some time. In fact, if you did that, this recipe could nearly be a quick weeknight dinner – it’s just the pasta dough making that takes a bit of time! 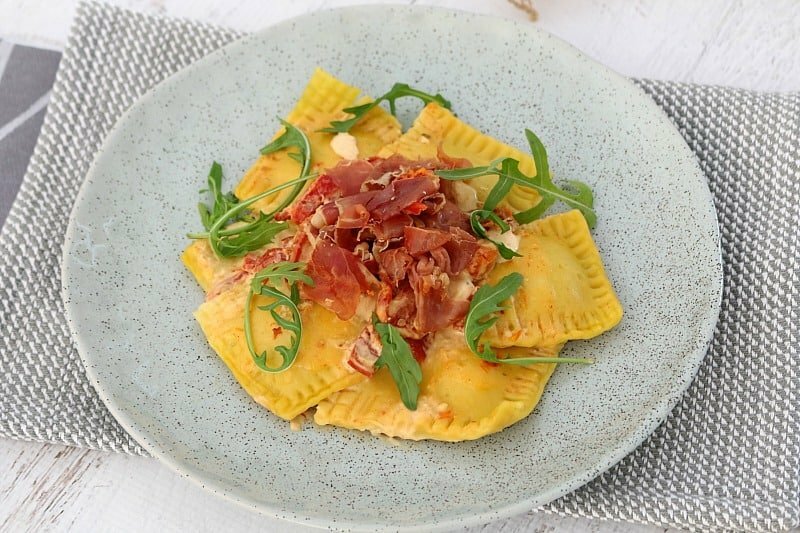 This Homemade Roasted Pumpkin Ravioli with Creamy Sun-Dried Tomato Sauce & Crispy Prosciutto definitely wins hands-down for when you’re wanting to make a dinner to impress someone special… or if you’re having friends over and want to take out the domestic goddess prize! This recipe makes enough for 4 big servings or 6 smaller servings. I kept a few of the pumpkin ravioli aside and mashed them up bit for Will and he LOVED them. And I loved the fact that we were all eating the same thing… no making separate baby food this time! Ooh one more thing! You can totally freeze the ravioli before you cook them. 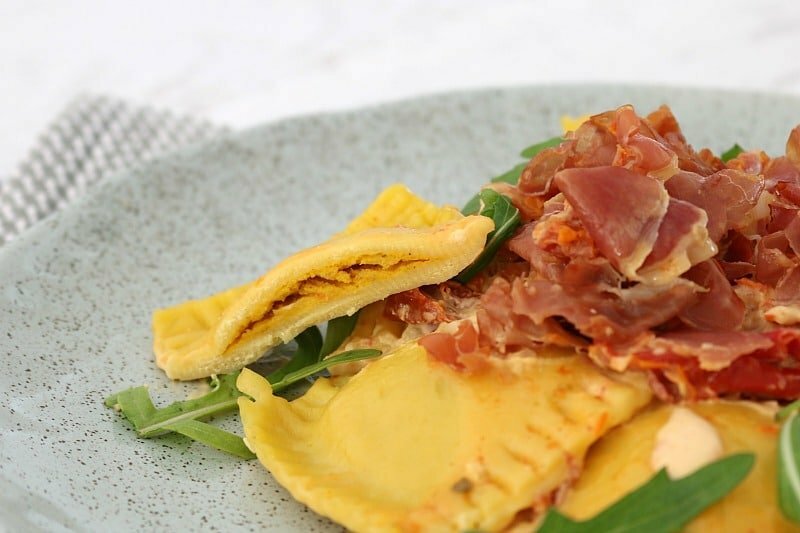 So if you’re like me and are making this dish for just 2 people, you can always pop the remaining ravioli into an airtight container and freeze them for up to 3 months. So there you have it! One fancy-pants homemade pasta recipe that will make you want to eat ALL THE CARBS IN THE WORLD!!!! 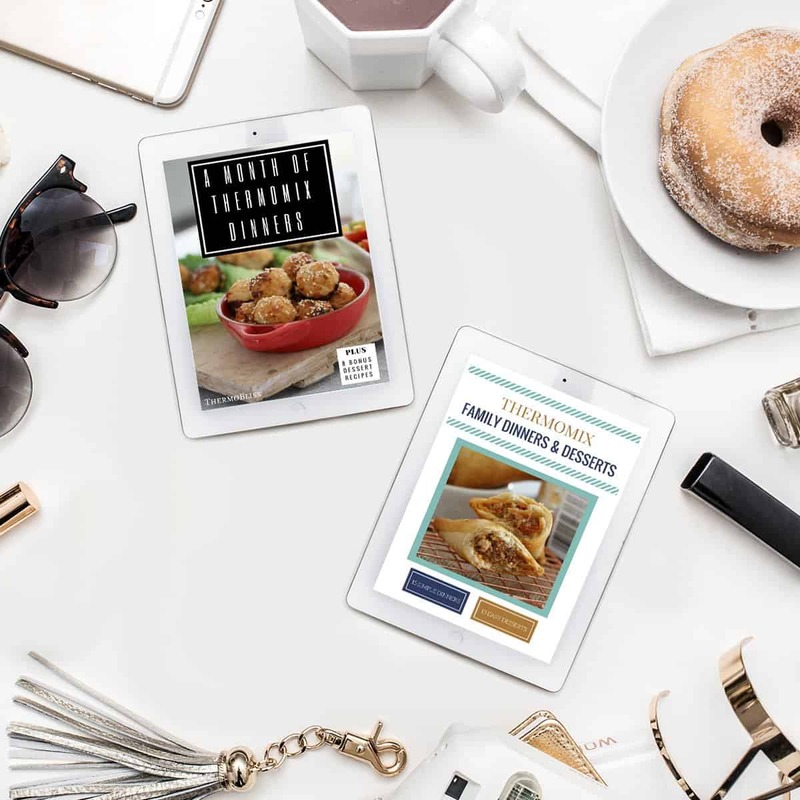 If you need some more yummy Thermomix dinner recipes, check out our best-selling ‘Thermomix Dinners eBook Bundle’… 2 great eBooks for just $15! 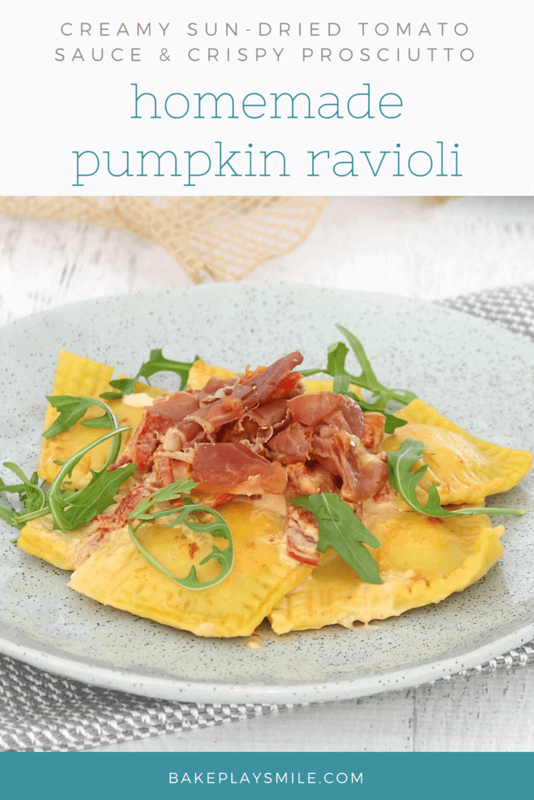 This Homemade Roasted Pumpkin Ravioli with Creamy Sun-Dried Tomato Sauce & Crispy Prosciutto is the perfect family dinner! Make your own pasta dough from scratch or use store-bought fresh pasta sheets. It's so delicious! To make the pumpkin filling, preheat oven to 200 degrees celsius (fan-forced). Chop pumpkin into 3-4 cm cubes and place onto a baking tray. Roast for 30 minutes or until soft. Add the cooled pumpkin to the bowl of a food processor and puree until smooth. Add the crushed garlic, grated parmesan cheese, ricotta cheese, breadcrumbs and egg and mix until smooth. Pour into a bowl and place into the fridge to cool completely. To make the dough, sift the flour into a bowl. Add the remaining ingredients and knead for 10 minutes. Form into a ball shape. Cover and place into the fridge for 30 minutes. Sprinkle a flat surface or bench with flour. Roll each portion out into a large rectangle (approx 1-2 mm thick). Place small portions (approx 1-2 teaspoons) of the pumpkin filling onto love of the sheets of pasta (5 cm apart). Lightly brush the exposed pasta sheet (between the filling) with water. Place the second pasta sheet on top and press down between each filling section to enclose. Cut into squares so that each contains one portion of filling. 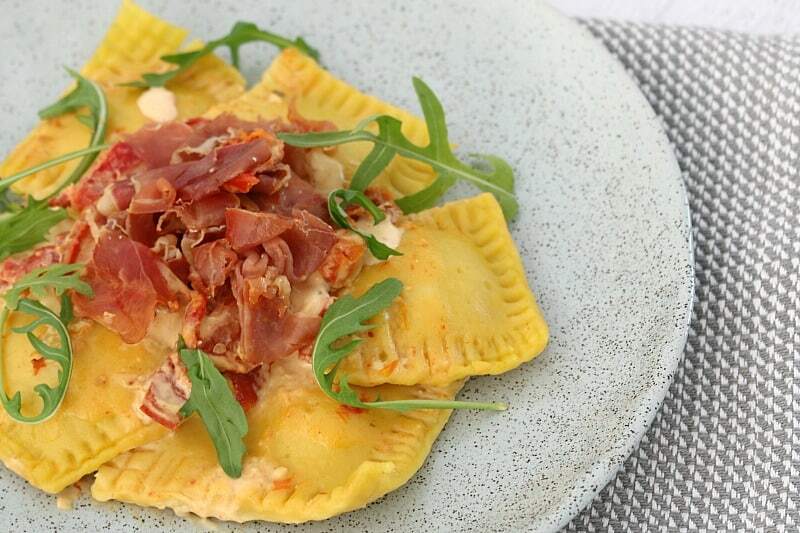 Place the ravioli squares onto a tray and leave on the bench to dry completely. 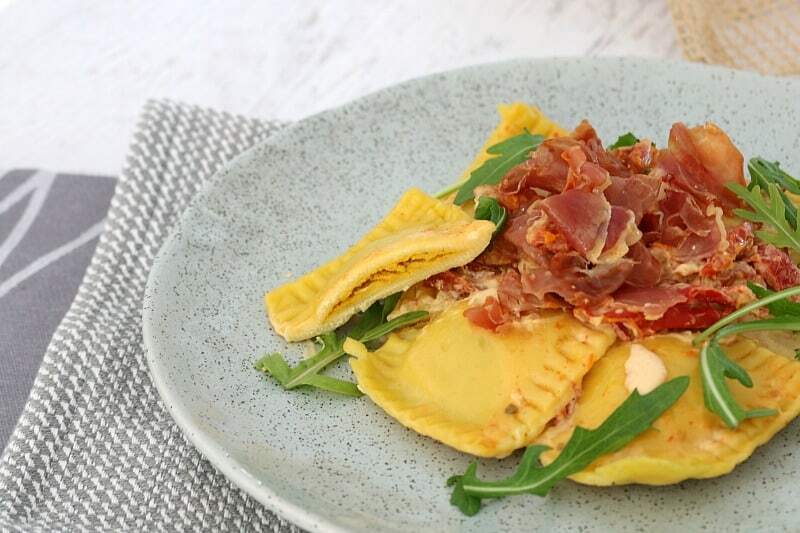 To prepare the sauce, place the prosciutto into a frying pan over medium heat. Cook until crispy and then set aside. Heat the olive oil in a frying pan over medium-low heat. Cook the crushed garlic until slightly fragrant. Add the sun-dried tomatoes and wine and cook for 3 minutes. Add the cooking cream and cook for a further 3 minutes over very low heat. Stir through the parmesan cheese. 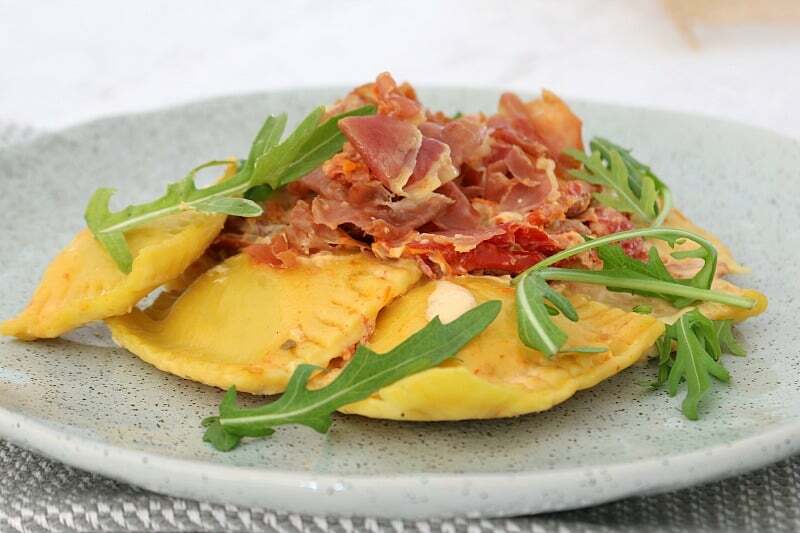 To cook the pasta, place the ravioli squares into a pot of salted boiling water and cook for 3-5 minutes. 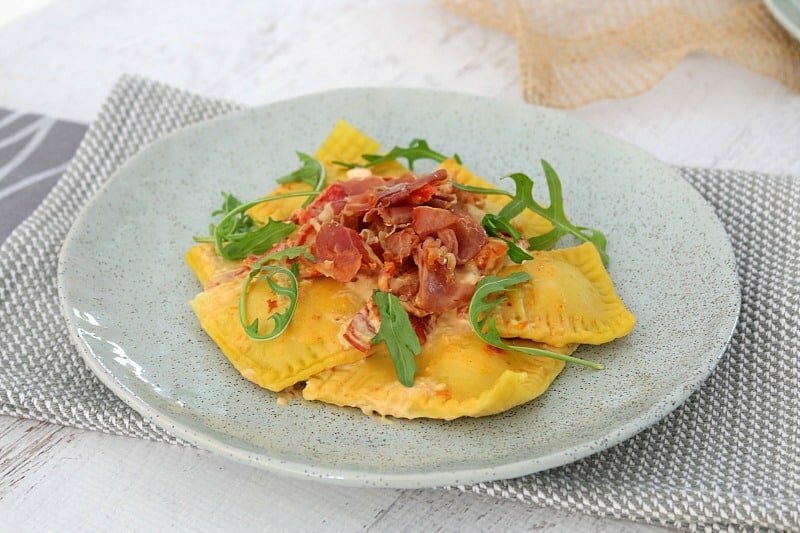 Serve the cooked ravioli with the creamy pasta sauce and top with crispy prosciutto and fresh rocket. Place the parmesan cheese into the TM bowl and grate on Speed 8, 6 seconds. Add the cooled pumpkin to the TM bowl and puree on Speed 6, 10 seconds. Add the crushed garlic, ricotta cheese, breadcrumbs and egg and mix on Speed 6, 10 seconds or until smooth. To make the dough, place all dough ingredients into the TM bowl. Mix on Speed 6, 10 seconds. Knead on Interval Speed (dough function), 4 minutes. Place the parmesan cheese into the TM bowl. Grate on Speed 8, 10 seconds. Set aside in a separate bowl. Place the crushed garlic, sun-dried tomatoes and olive oil into the TM bowl. Cook on Speed 1, 100 degrees, 3 minutes. Add the wine and cooking cream and cook on 100 degrees, Speed 1, 10 minutes. Stir through the reserved parmesan cheese.